Welcome to my home on the web. If you know why you've come, the links above should send you on your way. If you've stumbled here by accident.... hmmm, then I suppose you're on your own! 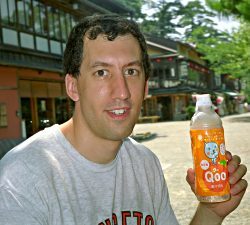 That's me enjoying a Qoo at Kenrokuen, in case you were wondering. At any rate, never forget: no matter where you go, there you are. Last modified: Mar 20, 2007. Photographs are copyright © 1992-2012 Kevin P. Rauch. All rights reserved.